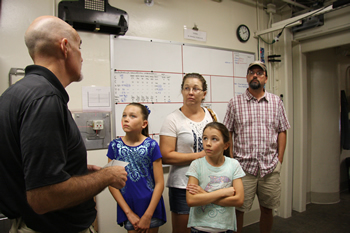 Associate Professor of Veterinary Oncology Jeffrey Bryan, DVM, gave the Dean family a tour of the MU Veterinary Health Center, and showed them equipment used in diagnosing and treating cancer in animals. Emily Dean said one of the highlights for her daughters was seeing a pug undergoing an ultrasound. 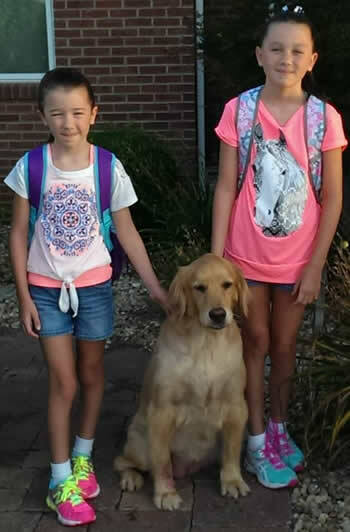 Bailey Dean, a 4-year-old golden retriever, was not so much a family pet, but more of a third musketeer to sisters 10-year-old Maddie and 8-year-old Emma. “No matter where the kids were, Bailey was right there next to them,” said Maddie and Emma’s mother, Emily Dean, of Cape Girardeau, Missouri. “The kids would get home from school and she was always there waiting for them to come through the door. She would knock everything over with her tail just to get to them,” she recalled. “Bailey would sit in the living room and the girls would dress her up ― bows, sunglasses and whatever they found in a box. Every night the kids would go to bed she would lie next to the bed and stay there all night,” Dean said. Emma and Maddie Dean with their dog, Bailey. Bailey enjoyed nothing more than joining the family on mule rides around the farm and to the creek. Late last summer Bailey developed a hot spot, ― a patch of dermatitis ― on her right foreleg. Although the lesion healed, the active dog began to show signs of a limp. In October, the Deans took Bailey to their local veterinarian, MU CVM alumnus Jeff Shively, DVM ’96. Suspecting that the hot spot had developed into a bone infection, he initially treated Bailey with antibiotics. But the limp didn’t improve, and a lump soon became evident. By November, the Deans received a grim diagnosis, Bailey had osteosarcoma ― a rapidly growing cancerous tumor in her bone. In January the Deans said good bye to their beloved dog. While Emily Dean investigated studies that are being conducted to find treatments for osteosarcoma, Maddie came up with ways she could help. With her 11th birthday approaching, she had an idea: She asked her birthday party guests not to bring any presents for her, but instead to make a donation to canine osteosarcoma research. 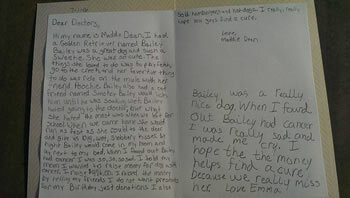 Maddie and Emma Dean wrote letters to the veterinarians at the MU Veterinary Health Center telling them about their dog, Bailey, and why they had raised funds for cancer research. Following her birthday party, she and Emma organized a second fundraiser to take place during a competition at a local CrossFit gym. Maddie sold hotdogs, hamburgers and other snacks, Emma ran a lemonade stand, and their cousin, Evan Farrow, age 8, joined in the effort and sold cupcakes. Between the two fundraisers, the girls collected a total of $476. Based on their mother’s research they decided to make a gift to the MU College of Veterinary Medicine Comparative Oncology Support Fund. The two girls, their mother, and their father, Richard Dean, traveled from Cape Girardeau to Columbia to present the gift to Jeffrey Bryan, DVM, MS, PhD, DACVIM (Oncology), associate professor of oncology, director of the Comparative Oncology Radiobiology and Epigenetics Laboratory and director of the Scott Endowed Program in Veterinary Oncology. Bryan said he was moved by the sisters’ dedication to helping other dogs after losing their companion. Associate Teaching Professor of Medical Oncology and Radiation Oncology Kim Selting, DVM, MS, DACVIM-Oncology, DACVR-Radiation Oncology, offers Emma Dean a high-five after she and her sister presented the money they raised for research into canine osteosarcoma.